Snoozing cats may lose an awful lot of their day to sack time, but they may be on to something. A Greek study published in the Archives of Internal Medicine this year showed that people who nap at least three times a week for at least 30 minutes are 37% less likely to die from heart disease. Another study, published in the online edition of the Journal of Applied Physiology, provided a possible reason: blood pressure eases in the time just before sleep. The coronary value of a siesta, however, is still questionable. 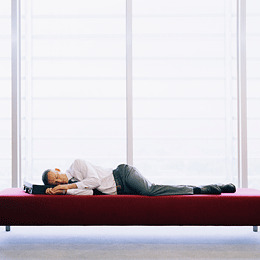 Researchers have yet to explore whether blood pressure rises upon waking from a nap. Snoozing certainly isn't a guarantee against getting heart disease, but the studies do provide an excuse for half an hour of downtime.